When you live in the city jungle for all your life and have a stressful job, it is very easy to lose track of what is really important. Pressure is the only constant thing and many people would do anything to escape even for a little while and relax. 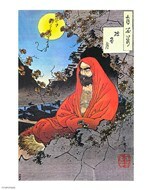 Buddhist Monk Prints are supposed to be a source of inspiration, because these clerics are the ultimate personification of calm and detachment. The prospect of meditating and taking some time for ourselves is alluring, but the truth is that in most of the cases, we don’t find the time to do it. Buddhist Monk posters can provide the incentive to put everything on hold every now and meditate, or at least sink into a deep state of relaxation. Even if we don’t succeed at first or if the pressing matters get the best of us, the Buddhist monk printings will still serve the purpose of enhancing the decor. ChefDecor.com has you fully covered regardless of what type of artwork you are searching for, at reasonable prices. It would defeat the purpose of trying to escape the mundane anxieties, if your Buddhist monk prints purchase would cause additional financial concerns. Depending on preferences and the type of decor that you plan on matching with Buddhist monk images, you can choose the colorful versions or the black-and-white ones.